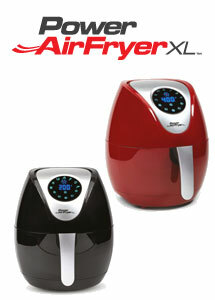 Enjoy fried foods without the guilt with the quick and easy five-in-one Power Air Fryer XL! Power Air Fryer XL is the five-in-one, 5 litre capacity Air Fryer that uses hot air technology and less oil and fat to cook healthier versions of your favourite fried foods in next to no time. It’s a quicker, easier and cleaner alternative to a deep-fat fryer or conventional oven. With 7 Pre-Set Setting you can focus on what counts at home. Air-fry, grill, bake, sauté and roast – all in one sleek and compact device. And it couldn’t be easier to use – simply add your food to the non-stick Easy-Load Fry Basket, slide it into the unit, and with the touch of a button, select one of seven pre-programmed cooking functions or manually adjust the timer and temperature settings. The digital control panel eliminates the guesswork and ensures whatever you’re cooking comes out perfectly delicious and crispy time after time.